Sponsorship application form (PDF, 533 KB) - This link will open in a new window..
Return the duly completed application to the Caisse by email. To submit a request, simply fill out the form (PDF, 95 KB) and forward it to the Caisse. Caisse populaire Trillium practices intercooperation whenever possible and, with a view to maximizing the scope of its efforts, regularly joins forces with Caisse populaire Rideau-Vision d'Ottawa. The Caisse populaire Trillium fund offers bursaries to students with special needs to help them pursue their studies at La Cité collégiale. The Caisse and the Fondation de La Cité collégiale organize a benefit golf tournament each year to raise money for this fund. The Caisse populaire Trillium invites you to visit its head office, located at 1173 chemin Cyrville, where you can admire the Monument de la francophonie d'Ottawa. The giant flag celebrates the contribution of Francophones to the economic and cooperative sectors. As you approach this architectural work, you will notice 7 monuments leading up to the 90-foot flagpole holding a 15-by-30-foot Franco-Ontarian flag. These monuments represent the increasingly great achievements of our builders, the entrepreneurs and businesspeople who were the foundation for the economic growth of the French-speaking Ottawa community. The monuments, placed in a line, represent the journey from yesterday to today: from 1610, the year the first French-speaking entrepreneurs, Samuel de Champlain and Etienne Brûlé, arrived, to the new millennium. The first monument, smaller and a little isolated, symbolizes the first homes and the founding of Ottawa, or rather, as it was called back then, Bytown. This monument is following by 5 others, each more impressive than the last, highlighting great business successes, signs of the prosperous Ottawa economy. The 7th monument, an unfinished granite block, has been left incomplete, a symbol of the future that has yet to be built. It is a monument that echoes the theme of Cooperation Week: "Together, let's build the future!" Each year, the Caisse helps purchase Christmas baskets for local disadvantaged families. The Fonds d'entraide Ottawa helps people in financial difficulty by providing financing to Ottawa families who don't have access to traditional credit subject to the usual credit analyses. Desjardins and the caisse populaires of Ottawa have donated $38,000 to the Fonds d'entraide Ottawa, an initiative that reflects Desjardins's values of community strength, financial education and community development. Desjardins has had mutual aid funds for several years but it's a first in Ontario. This partnership illustrates the efforts of the Desjardins caisses populaires in Ottawa and Entraide budgétaire Ottawa to meet community needs in a tangible way, by helping people and families in difficulty and focusing on prevention. 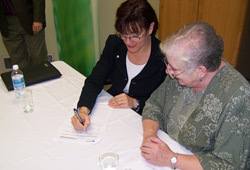 Diane Derom, Vice-President of Business Development Support, Ontario Executive Division, and Françoise Viau, President of the Ottawa Mutual Aid Fund Board of Directors, signing the partnership agreement between the 2 institutions.